Lee Harvey Oswald holding two left-wing newspapers The Militant and The Worker which are dated March 11 and March 24. 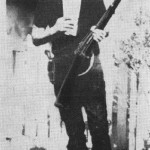 In addition to the two papers, Oswald is holding a rifle, and has a .38 caliber revolver strapped to his waist. The world stopped on Nov 22, 1963 when President John F. Kennedy was assassinated while driving his open limo through the streets of Dallas. The murder of JFK has almost from the second Kennedy was killed been shrouded in conspiracy theories and intense public interest. One of the many figures that became infamous as a result is the supposed lone gunman, Lee Harvey Oswald. Going from left to right are pictures CE-113A, CE-113B and CE-113C. 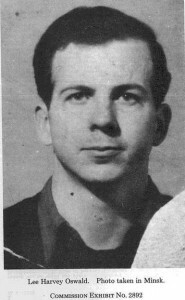 While growing up with his family Lee Harvey Oswald moved constantly around America. Before the age of 18 Oswald had lived in 22 different residences and attended 12 different schools, around New Orleans and Dallas. He had trouble spelling and writing and some say he had a learning disorder like dyslexia. Perhaps because of this and his constant movements he never finished high school. Though he had trouble with school he had a voracious appetite for books and by 15 became an ardent Marxist. His socialist beliefs didn’t stop him from joining the marines, an action seen as following in his idolized older brother’s, Robert, footsteps. He was accepted and trained as a radar operator, and spent time at various military bases throughout the Pacific. In the Marines, he scored a rating of sharpshooter but in latter rating he qualified as a marksman, a lower classification. Experts examining his records characterized his firearms proficiency as “above average” for the Military. The same experts when comparing average civilian males his age called Oswald, “an excellent shot.” In the marines he was court marshaled twice, first as a result of accidentally shooting himself in the elbow with a small, unauthorized handgun and later for starting a fight with a sergeant he thought responsible for the penalty he received. Disillusioned by his experience in the marines, he was able to get a “hardship” discharge by saying that he needed to care for his sick mother. After spending just one day with his mother he boarded a ship and traveled to the Soviet Union where he renounced his US citizenship and asked to join the Soviet motherland. The Soviet authorities at first denied his request but allowed him to stay after Oswald attempted suicide. He was sent to Minsk were he could be easily watched and worked as a metal lathe operator at the Gorizont (Horizon) Electronics Factory in Minsk, a sprawling complex that produced radio and televisions along with military and space electronic components. His friends and co-workers gave him the nickname, Alek, as Lee sounded too Chinese. Oswald spent almost 3 years in the Soviet Union but became disillusioned with the monotony and bureaucracy of the Soviet system and after a honeymoon period started to look into moving back to the States. At a dance in early 1961, Oswald meet Marina Alexandrovna Nikolayevna Medvedeva Prusakova, a 19-year-old student. One month later they married and Marina soon became pregnant with their first daughter, June. Almost a year of paperwork finally got Oswald and his family an exit visa, and on June 1, 1962 the three moved back to America setting up in Dallas. A number of failed jobs followed and without the friends and social life that he had in Minsk, Oswald began to look back at his time in the USSR with nostalgia. He even looked into moving back to the USSR or perhaps Cuba. These reborn socialist feelings probably inspired Oswald’s attempted assassination of General Walker, an outspoken anti-communist, anti-civil right, former US General fired for giving men under his command right wing propaganda. On April 10, 1963 from less than 100 feet Oswald took a shot at Walker who was sitting at his desk. The bullet hit the wooden window frame and instead of killing Walker deflected into his forearm. Oswald’s next attempt at a sniper shot would be from the Texas School Book Depository. Oswald had got a job working at the Texas School Book Depository via an acquaintance. On Nov 22, 12:30 pm Oswald shot Kennedy from the 6th story window of the Depository. Oswald fired three shots in 8.3 seconds, fatally wounding President Kennedy and critically wounding Governor John Connally. After the assassination Oswald hid the rifle behind some boxes and ran outside the building toward an unknown destination. Oswald was stopped by Officer JD tippet and when Tippet got of his car Oswald shot and killed him using a pistol. 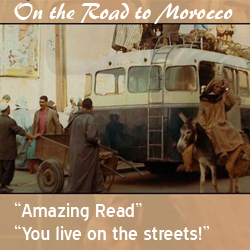 He then ran into a Theater that was playing the film “War Is Hell” starring Audie Murphy. A suspicious theatre worker called police and after a struggle police arrested Oswald. Dallas detectives exercising a search warrant of the Paine house on November 23, 1963 discovered a number of pictures including the one used on the February 21, 1964 Life magazine cover. Marina, Lee’s wife, had been staying with the Paine family. Donald Uhrbrock, a Life photographer, obtained the cover shot from copies he made from photographs in the police files. The cover shot was one of three similar shots later given the name, the backyard pictures. The shots have been shrouded in allegations that they where faked partly due to the retouching that occurred when LIFE used the image on their cover. (The February 21, 1964 issue with Oswald on the cover contained a number of articles including Oswald: Evolution of an Assassin, and Was Jack Ruby Insane?) 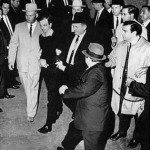 Oswald himself, when shown the pictures by Dallas Police after his arrest, insisted they were fakes. In a 1978 BBC television documentary Malcolm Thompson, a British forensic photography expert determined that the backyard pictures where composites. Similarly, a photographic analyst with the Canadian Department of Defence reached the same conclusion. On seeing the evidence and thoroughness of the HSCA investigation both experts recanted their conclusion and agreed that the backyard pictures were genuine. 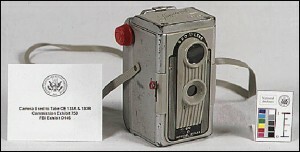 Oswald's camera used to take the picture The front plate reads: "DUO LENS - 620 - IMPERIAL REFLEX - MADE IN U.S.A."
Marina used the Imperial 620 Duo Lens Camera a very cheap and light model that uses 620 film (620 film is no longer manufactured). The camera is almost entirely made of plastic with both the lens and the viewfinder also made out of plastic. To take a picture using the Imperial, one looked down into the top of the camera which had a mirror inclined to 45 degrees in order to see the subject of the shot. Marina told the Warren Commission that she took the pictures in the backyard of the Oswald residence on Neeley Street in Dallas around March 1963. She gave different versions of exactly when the pictures were taken and was only sure that they where taken on a Sunday. However investigators were able to figure out when the pictures were taken by noting that the two left-wing newspapers Oswald is holding, The Militant and The Worker, are dated March 11 and March 24. Contacting the newspapers they determined that the publications were mailed on March 7 and March 21, by second-class mail. The postal service testified that the newspapers would have arrived in Dallas by March 28. 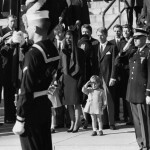 From all this information, the Commission established the date on which the photographs were taken to be Sunday, March 31, 1963. 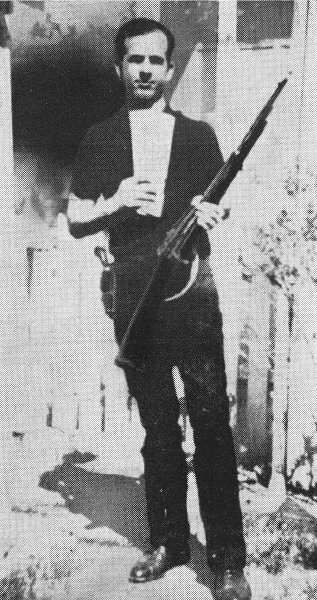 In addition to the two papers, Oswald is holding a rifle, and has a .38 caliber revolver strapped to his waist. 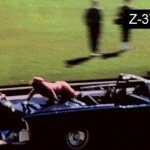 The 1978 Committee determined that the rifle in the picture was the same used to shoot Kennedy. The revolver was also determined to be the same used to kill Officer Tippit when Oswald was trying to make his escape. During the Warren Commission the pictures were labelled as exhibit CE 133-A and CE 133-B. Only one negative was found and the commission gave it the title, CE 749; it was the original negative of 133-B. The negative for photo 133-A was never found. Another photo was discovered much later and was used in the 1978 House Select Committee on Assassinations. Mrs. Geneva Dees of Paris, Tex handed over this photograph to the committee on December 30, 1976. Mrs. Dees testified that her former husband, Roscoe White, now deceased, acquired the photo while employed with the Dallas Police at the time of the assassination. 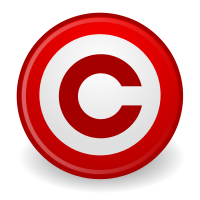 The new third picture was promptly named 133-C.